Not everyone loves dealing with banks or credit card companies. 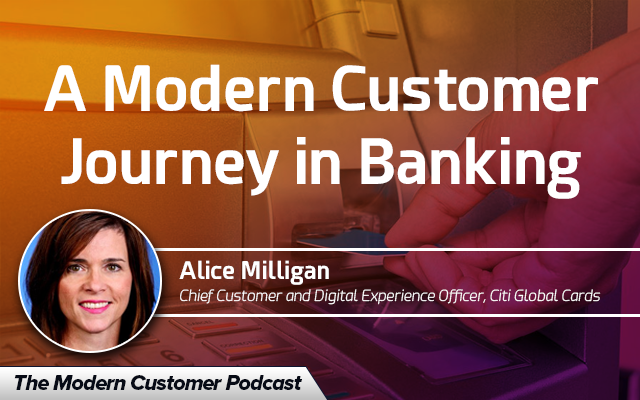 Citi Global Cards and its chief customer and digital experience officer, Alice Milligan, are changing that with a customer-centric culture and plans to make the entire credit card process simpler and easier for all customers. Ensuring the bank or credit card company is upfront about experience. Giving customers the tools to be in control of their own banking so they feel empowered and are less skeptical. Privacy and security. Making sure customers know the company stands behind them and can be trusted with their personal information. From those key areas, the company discovered how important time is to customers—everyone is busy and doesn’t want to spend a lot of time banking, but they still want the security and convenience. Understanding the customer has been a driving force for improving customer experience—when they realized a main concern of customers was to stop any charges on their card after it was lost or stolen, the company introduced Citi Quick Lock that allows users to quickly lock their card from a mobile app while they look for it. Citi has also been working to empower customers by giving them the tools they need right at their fingertips; at the start of 2016, the company had one-third of its functions available on its mobile app, but by the end of the year it was up to 75% of functions with the rest rolling out soon. Citi Global Cards continues to strive to enhance the customer experience by finding new ways to meet customer needs and solve their problems. This includes anything from gamification and rewards programs to developing the messaging and phone systems so that customers can contact the company however they wish and get a quick result no matter which method they use. Alice and her team also keep a strong pulse on the industry by talking to thought leaders, going to trade shows, reading, and putting the latest technology and thinking into action in ways that will help their customers.The customer experience is more than just putting things in the hands of customers. It’s listening to them and incorporating their convenience and wishes in every step of the process. That’s why customer experience is part of everyone’s job and responsibility across the company, regardless of what department they are in. Credit cards and banking might not be areas where customers love to spend their time, but improving the customer experience can lead to great results of satisfied customers.